When I started this business over two years ago, I would regularly travel across the country, meeting with prospective vendors and having fun adventures along the way. I would hop in my dusty Mazda Shtayim (Mazda2) and head-out to visit farms, kibbutzim, factories, apiaries, moshavim, studios, shops and markets. I used to write regularly and passionately about these encounters - sometimes posting them on a largely neglected blog, and other times just archiving them in my journal. And so, in the spirit of the new year, I vow to communicate more frequently with you: our incredible MATANA community. I LOVE reading all your posts, comments and emails, and want to see more of them! I hope my sharing will elicit a dialogue and create more opportunities for an exchange between us. I want to start off with a very personal piece. Because in order to really understand where we’re at today, I have to take you back to the beginning… A little over five years ago when a very naive and optimistic 25 year old girl decided to make aliyah. The piece came out a bit long, so I have divided it into 3 parts. Here is part 1. It was a difficult decision to say the least. To leave behind my family and friends and start a fresh, new life in Israel was a pretty dramatic and crazy thing to do. It took a lot of energy, resilience and patience and, to be honest, I am not sure my 31-year-old self could do it. But my 25-year-old self could. I spent that first year living in Jerusalem - waitressing, volunteering, interning and learning Hebrew. Eventually, I moved to Tel Aviv and found work as a grant writer. After a few years in the non-profit sector (making a non-profit salary), I knew it was time to do something more fulfilling and creative. I had become aware of the “subscription box” trend in the US and, in the entrepreneurial spirit of Tel Aviv, toyed with the idea of somehow bringing the model to Israel. This was back in the summer of 2014. I had now been an Israeli citizen for over two years and was [sort of] starting to get the hang of it. I lived with my boyfriend (now husband), Ofir, in a run-down flat in south Tel Aviv. He was finishing-up law school and about to take the bar exam. I was working as a grant writer for a few local NGOs. We rented-out our extra room on airbnb to help offset the insanely high cost of rent. On July 8, I was attending the Haaretz Peace Conference at the David Intercontinental Hotel. 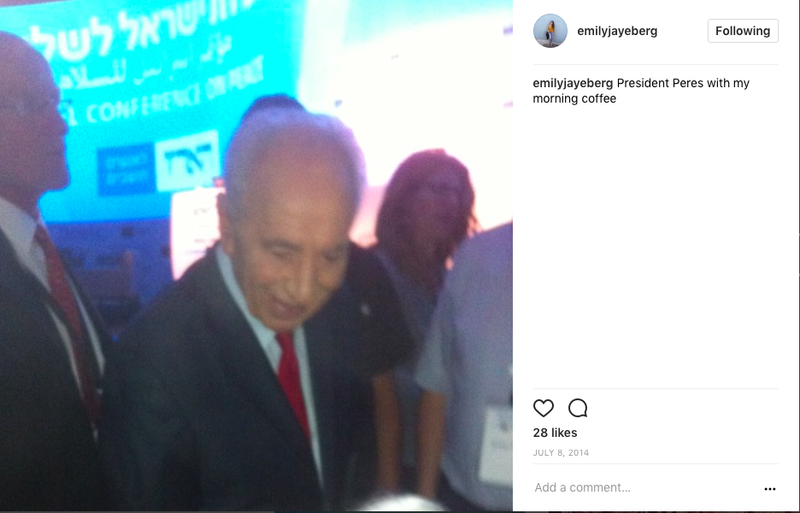 I had just snapped a picture for Instagram of President Shimon Peres (z”l) when I got a call from Ofir telling me he had been called-up for reserves. At first, I wasn’t worried because he was actually scheduled to go to reserves a few weeks later and I thought they had just moved up the date. TBH, I was a bit annoyed because he was supposed to work a few catering jobs that week before he began studying for the bar exam and we needed the money. But then I got a call from my neighbor asking me to look after his dog because he had also been called to reserves and I knew something was going on. I felt the energy in the room shift, looked around and saw that everyone was on their phones. I left the conference and ran home to meet Ofir. Shortly after, his mom came to pick us up in Tel Aviv so he could get his uniform before catching the bus. On our way, the first (of many) sirens rang and we ran out of the car to duck under some shelter or doorway. Rather than catch a regular bus down to his base, we took Ofir to a central drop-off point at a local school where dozens of reservists were reporting for duty. This felt dramatic. We said goodbye and drove off, obviously not realizing that this impending conflict would last 40 days. I then remembered we had two Italian tourists renting out our extra bedroom who had no idea what to do in this situation. I sent them a message telling them not to worry and to go into the stairwell if there was another siren, since our old crumbling building didn't have a bomb shelter or safe room. They got on the next flight out. The rest of the summer was pretty terrible. In Tel Aviv, it was not business as usual. The city was dead with no tourists whatsoever. The beaches and cafes were empty, which felt apocalyptic in the Tel Aviv summer. At one point, they even closed the airports, which was scary and made me feel trapped. I continued to go to work: we would all obsessively refresh Facebook, Ynet, Haaretz, JPost and the New York Times. We all had those anxiety-inducing “red alerts” on our phones. I would frantically check WhatsApp to see if Ofir had messaged me.It was awful to hear the news coming out of Gaza and to see young soldiers’ faces on the newspapers each morning. From an economic perspective, it was brutal. As the weeks crept on, we realized that Ofir was going to miss his chance to take the bar exam this round and would have to wait for the next one, pushing back his ability to start work. Of course, we had no airbnb requests. One day, I got an email from a Canadian Jewish organization with the subject “Shop4Israel,” encouraging its readers to “go to their local retailer and buy Israeli products.” It listed large corporations like Ahava, SodaStream, Naot, and Strauss. The email also had a few links to outdated websites selling Judaica. I thought to myself, “wait a minute, these are their options? What about all of the small businesses around the country that make such beautiful products? Why don’t they promote these instead?” I knew that, given the choice, Israel’s supporters around the world would love to buy Israeli products and support small business owners, but realized that they do not have a way to do so. Local artisans have no way to access this eager and sizable market. With the subscription box idea lingering in the back of my mind, I put two-and-two together and thought: maybe there is a way to bridge this gap. Eager for this distraction, I wrote a business plan. I drove around the country, meeting with different Israelis who showed me around their factories, orchards, farms, kitchens, workshops or studios, telling me their founding stories in fascinating detail. I knew that, in addition to sourcing high quality products like organic olive oil and pure honey, I would have to include the vendors’ stories. I wanted customers to know who they were supporting with their purchase and to learn a bit about Israel’s history, geography and culture. I decided to feature one business each month and showcase their products while telling their unique story. I felt that, with enough customers, I could really make a significant impact for these businesses: maybe they could buy a new computer or tractor, hire a new employee or move into a larger space. Meanwhile, Ofir finally came home at the end of August. He began to study for the bar exam and I continued to work as a grant writer during the day while developing the business in the evenings and on weekends. Money was tight. We still didn’t have any airbnb requests and only one income. When Ofir finally did get paid from the army for his 40 straight days of service, he received the minimum because he had been a student at the time. I realized, even more than before, my burning desire to build a business that would support people who choose to live here, despite its hardships - myself included. I was so excited and passionate, knowing I had a great idea on my hands. I decided to run a pilot and sent 30 boxes to friends and family across North America to test out the model. After a year of careful planning, I officially launched Blue Box in July 2015 and grew the customer base while I maintained a full-time job. I put all the profits back into the business, believing that I could grow it into something huge. I put some money into marketing and attended a conference in DC. Several articles were published in Haaretz, Forward, The Jewish Independent, The Times of Israel, The Jewish Week, Israel 21c, Channel2, Hadassah Magazine and The Jewish Food Experience. We had momentum and things were going well. I left my job to pursue this full-time. Then, one night in January 2017, I received an email from a lawyer of a major Jewish organization, demanding I “cease and desist” use of the name Blue Box as it was infringing on a trademark. I should probably mention that, around this time, I also found out that I was pregnant.